Looking for feedback on fluid dynamics not quality of materials, etc. 1. I will remove the slope from the return line in the final iteration. 2. I dont want to rely on any sort of check valve on my return manifold, so dont worry about that. Thank you. Just curious: is there a particular reason you're switching to schedule 80 for the final plumbing ... or are you just going to 80 for the gray color? It wont actually be schedule 80, a 4$ can of krylon fusion grey will make everything look "good enough"
Roger that. Was just curious since you've already got the sched. 40 cut to just about where you want it. The gray Krylon ought to make look quite nice. Looks fine as designed. 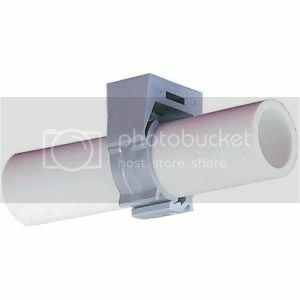 The only change I’d make would be to connect the pvc to your return pump using flexible tubing. That’ll help cut down on noise and vibration. Plus it makes it easier to remove when time comes to glean the pump. I don't know what kind of drain system you're using, but I never like horizontal runs like that in my drains. At least it gives me pause. It looks like you're using a "herbie" setup with the horizontal one as the emergency, though, so that seems OK to me. I'd put the valve way down in the sump as near the water surface as convenient, not up as a horizontal section. The valve is supposed to go close to the water surface. I have never seen a write up or photo where the gate vavle on the Herbie wasnt within a few inches of the drain bulkhead. Could you provide a link to the style you're talking about? No, but it's easier to purge the air out of the line to start the siphon going if the line has no interruptions on the way down to the sump. Which pipe will fill with water faster when your return pump is turned on and the overflow starts flowing? As long as the plumbing ends just barely under the water line and not submerged way down the siphon should be able to start either way, though. Man Dan I aint got that kinda money for gate valves. Whats the deal with check valves though? Ive read the theory but if i set my sump and returns up properly to prevent siphon and have a sump that can handle the surge why install a float? Im not following on what the diagram is? Ive always had durso so this is new to me. The red line is the valve (gate or ball) with a restricted flow of water going through it. The one on the right with the valve on the bottom will fill with water (and have the air purged) faster because the restriction is at the bottom. Also, don't put the termination of the plumbing way under the water level of your sump because you'll have to push all of that water out in order to then push the air out to get your siphon going. End the plumbing run just barely under the water level of your sump. Since the Herbie drain system doesn't have air in it, you won't get lots of salt spray like you would with a Durso. To add to Alan's explanation, a siphon kind of works like a vacuum that is powered by weight. The more water that is 'pulling down' on what is up in the overflow chamber before a restriction like a valve is encountered, the easier it will be for the siphon to get started. By putting the valve -- or restriction -- down low as close to the sump as possible, the more 'pull' the siphon will have during start up, and the easier it will be for it to purge any air and get started. As far as a check valve in the return line goes, you are correct. As long as your sump has enough 'free space' to handle whatever volume of water will come down it before the return nozzles in the DT draw air and break the back siphon, you have no need for a check valve. However, if your sump doesn't have enough free space to handle the back siphon--or your sump gets VERY close to overflowing from the back siphon volume, then a check valve may be a good precaution. I don't know what kind of budget you have to work with, but gate valves can be had for as low as $21 at Marine Depot (a WAMAS sponsor) or even as little as $10 + shipping at FlexPVC.com. They do tend to be much easier to dial in than ball valves. Thanks for the advice on the gate valves i think between price (i can replace 5 ball valves for the coat of one gate of comparable quality), their size vs gate valves, and their lack of unions theyre not worth it for my application. So it seems to be fairly common practice to end ones emergency flow discharge pretty high up from the sump so they'll hear water cascading/splashing if its the route for water instead of the siphon drain. Is this necessary/advisable? As for ending the primary drain level "under water" is best practice a straight entry. Using a "reverse durso", or something else. Thanks for the advice on the gate valves i think between price (i can replace 5 ball valves for the coat of one gate of comparable quality), their size vs gate valves, and their lack of unions they're not worth it for my application. With all the advancements in power heads, I don’t really see the need for a full siphon. Think high flow in tank, low flow to sump. The main benefit of having the full siphon is the increased volume of water it can carry. If properly tuned the placement of the gate valve shouldn’t be much of a problem, and could still be dead silent. This set up will also have the benefit of reduced water in the pipes resulting in less water drained to the sump in outages since he opted against using a check valve. If you are planning a complete overhaul, I’d definitely make all the changes previously mentioned though as there is increased flexibility. The reason you want a full siphon is so there is no noise coming from your plumbing, something you cant accomplish with any other method. The gate valve exist to dial in whatever flow rate you desire. As for the emergency drain, I ran it just like the other two (just below the surface). The noise from the overflow is different enough to know something is up. You'll also hear the initial flush of both as they go full siphon. If having the extra alert from the splashing water is beneficial, use it though. We're coming up on three years now and the emergency has never been used and the secondary rarely goes full siphon (when it does, I run a flexible brush through the lines to clean them). Well I’ll have to disagree with this comment. The full siphon poses dual function- reduced noise & increased volume displacement. Noise can be reduced numerous ways! Noise from our plumbing comes from 2 sources, splashing and bubbling. Yes a full siphon eliminates both of thes but it is NOT the only way to. Providing all the plumbing to the right of his gate valve is filled with water, and the flow is equal to the return there will be NO noise. Being that his gate valve is positioned upstream on his horizontal run will help with the air (bubbles) making its way back up once it is tuned in. The benefit of his setup is that he also never have to worry bout re-establishing a siphon. There is always more than one way to accomplish any task if you put a little thought into what your specific needs are. The solution isn’t always what everyone else is doing. Is it possible we're using the term "full siphon" differently? When I say "full siphon", I mean all water and no air, regardless of the flow rate. It appears to me that you mean "a full-rate siphon, unrestricted by a valve". Providing all the plumbing to the right of his gate valve is filled with water, and the flow is equal to the return there will be NO noise. Because, if the tank-to-sump plumbing is filled with water, it's a siphon. In which case, we're all in violent agreement that a pipe full of flowing water is silent. Yes, in this case there will be air downstream of the gate valve, so it wouldn’t be a full siphon. There is a partial siphon however (overflow to valve) and that’s why it will still be silent.